Kiddo: What kind of cookies, Mom? Me: Grain-free, but other than that, I’m not sure. What kind do you want? Kiddo: Chocolate Chocolate Chip. But, with peanut butter. I think he has an obsession with putting peanut butter together with chocolate things. Anyway, I thought he was a little crazy, perhaps sleep-deprived, if he thought I was going to create a brand-new recipe at 8:00 on a Saturday night. And, I told him no on the peanut butter, but I was happy to make chocolate chocolate chip. Except there’s peanut flour in them. And, the ones that are left after hauling them around Ironman in a ziplock baggie look a bit more like crumbs. Not pretty. But, still delicious. Not that there are many left…. Oops, maybe I’ll just eat these last few for breakfast…. Preheat oven to 350°. Line 2 cookie sheets with parchment paper. Using a cookie scoop, scoop dough onto parchment lined cookie sheets. Flatten slightly with the palm of your hand. 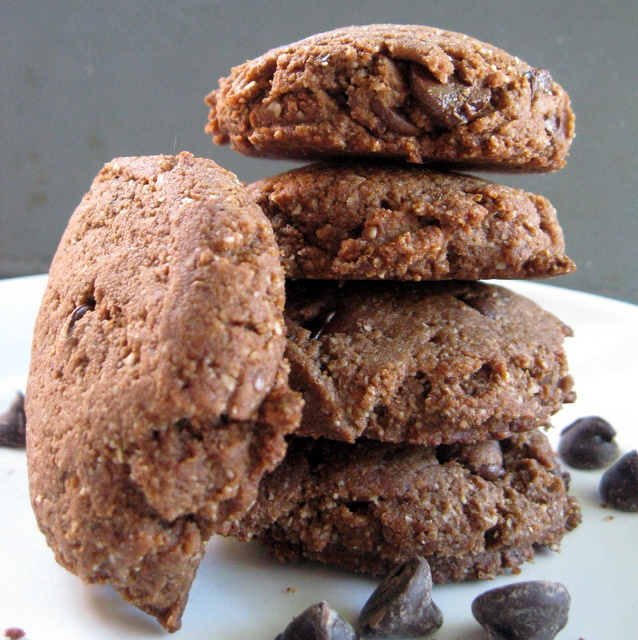 This entry was posted in chocolate, cookies, flax seed, grain-free, nuts, vegan. Bookmark the permalink. These cookies sound so amazing!! Thank you for sharing your very creative recipe. I know my children would love these for an ocassional splurge. I am so making these when I get back to the States and get my hands on PEANUT FLOUR – LOVE it so! I use coconut flour too. Delicious. It is not as cheap as other flours but i’ve just landed some from an Asian store for a quarter of the price! Not used it yet so fingers crossed it will be the same quality. Interesting! I’ve never looked for coconut flour in the Asian markets around here. I’ve been meaning to make a trip, so I’ll have to check it out next time I’m there. I’ve gotten some great frozen young coconut meat at the Asian store, way cheaper than buying young coconuts. I so love my Asian market. I’d say anything with peanut butter or flour and chocolate is a hit in my book. I need to break out and try these flours. Thanks again for inspiring me! If I ever find peanut flour, I’m making these! Yummm.